Free Hot Chocolate (subject to participating stores) for first 10,000 users to claim a barcode within the app and present it at a participating Hotel Chocolat store. This voucher may be exchanged for one standard adult ticket at a price of £3 for any 2D performance at any Cineworld cinema in the UK (excluding Unlimited and VIP/premium screenings, Cineworld Cinemas at Leicester Square or Picturehouse cinemas). 33% off any pizza. Code expires 05.12.2017. 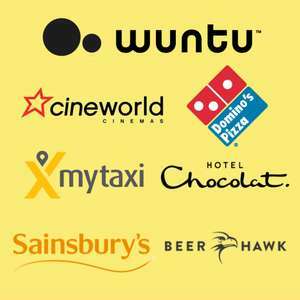 Single use codes valid for 350 Rakuten Super-Points (RSP) each to use in the Rakuten UK store. RSPs expire 48 hours from the date you apply them to your account unless used. Once you have exchanged the RSPs for a rental, you will have 48 hours from the exact rental time to view the film. 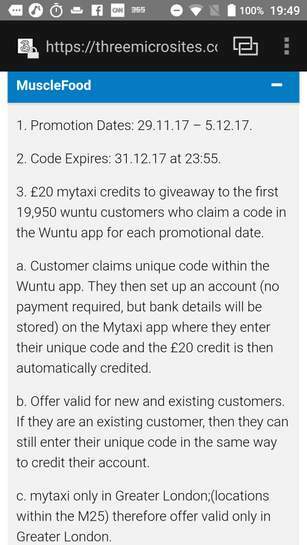 £20 mytaxi credits to giveaway to the first 19,950 wuntu customers who claim a code in the Wuntu app for each promotional date. 50,000 digital downloads of Grazia magazines to giveaway to the first 50,000 users to claim the offer on the Wuntu app. User downloads the relevant app for the magazine and is able to download and view the digital edition. 33% off our Christmas Selection Box: which contain 4 beers, and a snack. beerhawk.co.uk/sel…ntu which contain 4 beers, and a snack. Prize draw to win one of 10 x £200 gift cards to help pay for your Christmas food shop. Total of 10 winners will be drawn and will be sent one physical gift card worth £200 to be redeemed in-store (not valid for online transactions). £200 gift cards do not need to be used all in one transaction. This gift card code will expire 24 months from activation. Weekly WUNTU guessing thread, inaccurate & modified time & time again. Would be good if the ADMIN did their jobs and don't allow speculation as …Would be good if the ADMIN did their jobs and don't allow speculation as real offers. The Wuntu weekly guessing the offers isn't a deal!! All the offers that were posted yesterday were provided with proof. And regarding the Domino's offer I confirmed with an operator over chat who told me the offer is going to be free pizza. They probably changed the offer later (this has happened before) or it could be possible he passed on a wrong info. Free Rakuten movie rental, £3 Cineworld ticket. Those 2 alone means its a good week for me. get to watch 2 films for £3. All the typical self-entitled moaning myrtles are out in force again. @Adhith You shouldn't keep assuming by posting incorrect information on Hot UK Deals, it really lowers the quality of Hot UK Deals, it affects the good reputation is has to many who visit this website. 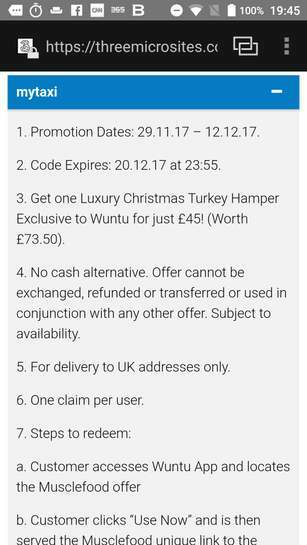 Can you please post after 9:30am on the day with the available correct information for Wuntu deals and freebies, it would be much more useful and helpful to everyone! This isn't the first time you have done this, it's frustrating for me and many others. Also Why is it only Cineworld? Why dont they do Odeon or Vue? Nearest Cineworld is 100miles away. How large is the Dominos? Is it collection or delivery? I'm guessing it's …How large is the Dominos? Is it collection or delivery? I'm guessing it's a small pizza for collectionBut at least it's not Bella Italia or Ls Iguanas like every week Also Why is it only Cineworld? Why dont they do Odeon or Vue? Nearest Cineworld is 100miles away. Small personal pizza I'm sure like last time. Not other cinemas because this is the one they've done a deal with. Sadly the free deals seem to be disappearing and is turning into paid ones. Still, had a nice lunch with wife for 6 quid today. Small personal pizza I'm sure like last time. Not other cinemas because …Small personal pizza I'm sure like last time. Not other cinemas because this is the one they've done a deal with.Sadly the free deals seem to be disappearing and is turning into paid ones. Still, had a nice lunch with wife for 6 quid today. But why can't they do Odeon or Vue once every now and then. There's nothing about free . That was confirmed by the wuntu customer care. Maybe they are still updating the site which could be why it is not up yet on the website. Dominos is good but there's not much worth seeing in the Cinema. Already seen Paddington 2 with the kids and booked our tickets for Last Jedi in December with previous free tickets. After that, there is nothing worth watching. Wait what, £20 gets you 4 bottles of beer? Even with the discount this looks expensive. According to the website,my taxi is a ? hamper. And ? food is taxi credits. Cineworld codes you can't book advanced screenings. Yes you can...I have now twice booked advance screenings with the Cineworld codes from Wuntu. Yes you can...I have now booked advance screenings twice with the …Yes you can...I have now booked advance screenings twice with the Cineworld codes with Wuntu. I've also booked advanced screenings before but I've just checked the t&c's for tomorrow and it says you can't. Dominos is good but there's not much worth seeing in the Cinema. Already …Dominos is good but there's not much worth seeing in the Cinema. Already seen Paddington 2 with the kids and booked our tickets for Last Jedi in December with previous free tickets. After that, there is nothing worth watching. Yep you can, I booked star wars and jumanji last week. Yep me too, looks well funny. I'm only going by what the website says. Yeah it's all crap at the moment. Who cares, it works so don't mislead anyone. 100 miles trek to watch a film. Might be better off downloading. My nearest Cineworld is 7.8 miles. 100 miles trek to watch a film. Might be better off downloading. My …100 miles trek to watch a film. Might be better off downloading. My nearest Cineworld is 7.8 miles. I didn't say i believe what the website says. Dominos one is crap. Cineworld one works like a charm. Have been able to for the last few weeks booked Star Wars and pitch rubbish for the daughter just on Sunday. Seemed to have nabbed Hotel Chocolat off O2, nothing good left on there nowadays - even Caffe Nero Tuesdays have been pushed back to 2pm. Only 34 stores for the Hotel Chocolat offer. Check the t&c before you decide to visit your local store. Film stars don't die in Liverpool is really good although sad . The Florida project and The Disaster Artist have great reviews - haven't seen those yet.